ROARING LION (3x Gr.1 in 2018 - Gr.1 Eclipse Stakes, Sandown; Gr.1 Juddmonte International; Gr.1 Irish Champion), HAWKBILL (Gr.1 Dubai Sheema Classic in 2018, Gr.1 Eclipse Stakes, Sandown in 2016; Gr.3 Tercentenary Stakes, Royal Ascot), OSCAR PERFORMANCE (Gr.1 Woodbine Mile in 2018, Gr.1 Breeders' Cup Juvenile Turf, Gr.1 Secretariat Stakes, Gr.1 Belmont Derby), STEPHANIE’S KITTEN ($4,292,400), Eclipse Champion BIG BLUE KITTEN ($2,981,000) DIVISIDERO (Gr.1 Turf Classic Stakes, Churchill Downs), REAL SOLUTION, SADLER'S JOY, KITTEN'S DUMPLINGS, ADMIRL KITTEN, CHIROPRACTOR and BOBBY’S KITTEN ($1,424,417). Also, CAMELOT KITTEN (Gr.2, Gr.3) and Gr.3 winners TAAREEF (Prix Daphnis, Chantilly), HOME RUN KITTEN, SMOKEM KITTEN, OSCAR NOMINATED, etc. 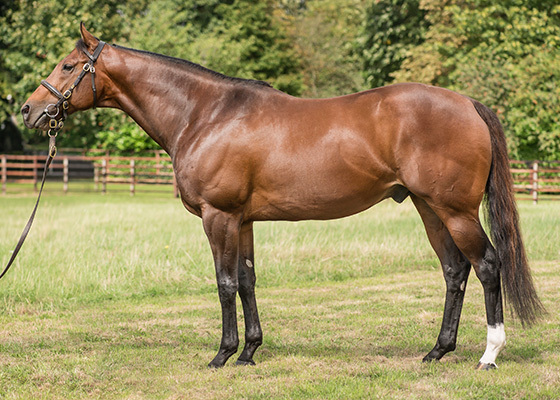 MAJOR MAGIC (USA) (09 g. by Kitten’s Joy (USA)): 5 wins in USA and $172,266 inc. Chenery S., placed 10 times. BELIEVE IN KITTEN (USA) (10 c. by Kitten’s Joy (USA)): 5 wins to 2016 in USA and $131,024. BOBBY’S KITTEN (USA) (11 c. by Kitten’s Joy (USA)): 6 wins to 2016 USA and Ireland, and $1,424,417 inc. Gr.1 Breeders’ Cup Turf Sprint, Gr.3 Pilgrim S., L Cork S., and Penn Mile S., placed 2nd Gr.2 Nat.Museum of Racing Hall of Fame S., 3rd Gr.1 Breeders’ Cup Juvenile Turf (c&g) and Gr.1 Ricoh Woodbine Mile S., 4th Gr.1 Breeders’ Cup Turf Sprint. CAMELOT KITTEN (USA) (13 c. by Kitten’s Joy (USA)): 4 wins at 2 and 3, 2016 in USA and $467,902 inc. Gr.2 American Turf S., Gr.2 Hall of Fame S. and Gr.3 Pennine Ridge S., placed three times inc. 2nd Gr.3 Dixiana Bourbon S., Gr.3 Saranac S., 4th Gr.1 Belmont Derby Invitational S. (as per 7th September). CELESTIAL CANDY (ARG): won Gr.2 Clasico Carlos Tomkinson, and a further 3 Gr.3 races. PARADISE CREEK (USA): 14 wins in USA and $3,749,574 inc. Gr.1 Washington D. C. International S., Gr.1 Hollywood Derby; sire. WILD EVENT (USA): 10 wins in USA and $990,624 inc. Gr.1 Early Times Turf Classic S., 2nd Gr.1 Gulfstream Park Breeders’ Cup H.; sire. FORBIDDEN APPLE (USA): 8 wins in USA and $1,913,864 inc. Gr.1 Manhattan H., 2nd Gr.1 Manhattan H., Gr.1 Breeders’ Cup Mile; sire. I’M VERY IRISH (USA): 5 wins in USA inc. Smoke Screen S.; sire. SHACKLEFORD (Preakness S), DISCREET CAT, DIPLOMAT LADY, FOREST DANGER; also a leading broodmare sire in the USA incl, in 2016, Champion NYQUIST. To date his daughters have produced 23 Stakes winners and the winners of approx. $41,000,000.